I have baked a lot of cakes in my time but this one has become my all time favourite. Its a recipe from Leila Lindholm. 1. Preheat the oven to 175 Dec C.
2. Beat the eggs and the sugar until pale and fluffy. 3. Mix together the dry ingredients and fold into the egg mixture. 4. Stir in the oil, carrots and coarsely chopped walnuts. 5. Put paper cases in a muffin tin and pour in the mixture until the cases are tow-thirds full. 6. Bake in the centre of the oven for 12-15 mins. Leave to cool. 7. Make the frosting by mixing together the ingredients until creamy. 8. 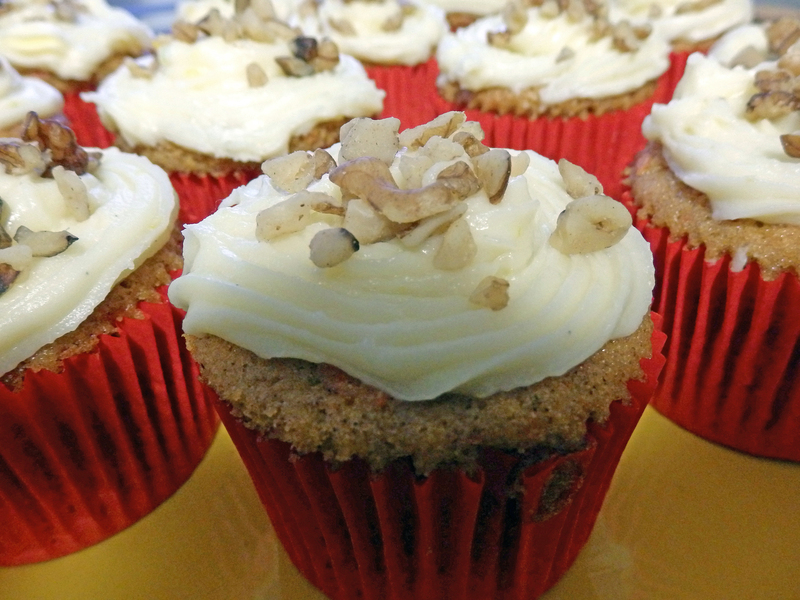 Spread the frosting on top of the cupcakes and decorate each one with a whole walnut.